The New Naturalist Series is a unique and bespoke appreciation of British wildlife focussing mostly on habitats or groups of animals, but it rarely has single species volumes. This is only the second exception after ‘Badgers’ (by Timothy Roper, 2010, 388pp) since the closure of the New Naturalist (NN) Monograph series. Written by retired senior lecturer in zoology at Royal Holloway College (University of London) Dr Pat Morris MBE has spent a lifetime studying hedgehogs around the world, including New Zealand where they were introduced, and has incorporated the fruits of his exhaustive scientific research into the book, on topics such as spines, food, ecology, mortality, as well as incorporating the works of many others. It is a good read. 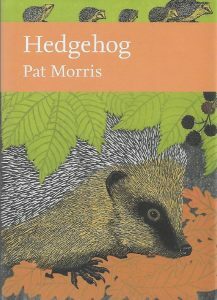 Fully illustrated in colour throughout, which is the welcome custom of new NN works, the book has 13 chapters ranging from early accounts of hedgehogs ‘more picturesque than trustworthy’, through to reproduction, hibernation (a key section explained in great detail), death on roads, persecution, and hedgehogs and people. This is a comprehensive tome written by the best person to write it, and it stands as a remarkable work in the full spirit of NN series books, and a valuable addition to any bookcase.